cookie's finally down for a nap, but of course it's right around the time when i have to jet to the post office so i can mail out my student loan payment and the check for the two outstanding parking tickets that canuck doesn't know about (yet, and i'm sure that conversation will be all shits and giggles). stupid canada post upped the postage to the states, right after i bought a whole book of stamps to the US, and i'm not sure where i can get "filler" stamps. i'm so confused! so i decided to let someone else handle it so that if/when it gets lost i have someone else to pass the blame off onto. i just have to get my arse out the door and into the cold so i can get this done. argh, why do i keep putting this off??? today was my day to volunteer at the co-op playschool, and i loved it! the kids are absolutely a blast to hang out with, and all sorts of different personalities and maturity levels. there was one girl who invited me to her house for hot chocolate and to play with her dog, and another girl who wanted to sit in my lap each circle time, and the little boy who made "purple poopie tea" and was nice enough to share. kids are a rip! but there was also a kid who was very aggressive and kept punching and shoving anyone who got in his way - he even growled at one little boy over a play-do arguement. he was placed in time out three times in the span of two hours. canuck warned me about that kid, and i could see why. cookie was one of the five kids he made cry today. pink barbie is seated on the left. 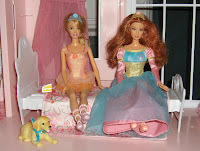 she is wearing the orange tutu that usually adorns j-lo barbie (seated on the right), but she usually wears a pink tutu hence the name "pink barbie". j-lo barbie is wearing the rainbow dress and was given that name because personally i think she looks like j-lo, cookie heard me say that and that name just stuck. these are her two favorites and cookie likes to say that they are married (i officiated). btw, the prince is around, he's just not in the picture, both literally and figuratively. 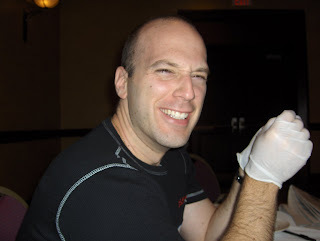 at the dentsply course in september. 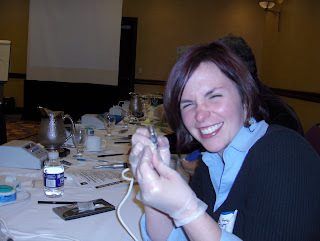 all it takes is some free lunch and some extracted teeth to make us happy. i knew there was a reason why i married this guy!